I seldom buy watches on impulse. 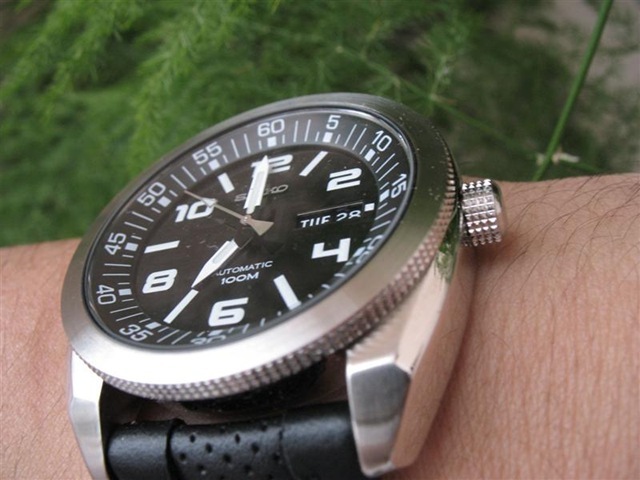 Usually I would conduct several weeks or months of research and mulling about before deciding to buy a particular watch. When my watchmaker took out the stunning looking timepiece out of his box (he hadn’t even had the time to display it in his watch glass case) my jaw simply dropped. “Wow! What IS that Seiko?" I blurted out. It wasn’t a Seiko 5 and it was the largest 7s-caliber Seiko that I’ve ever laid eyes upon. It was even larger than the SKX007 and even the Monster diver! 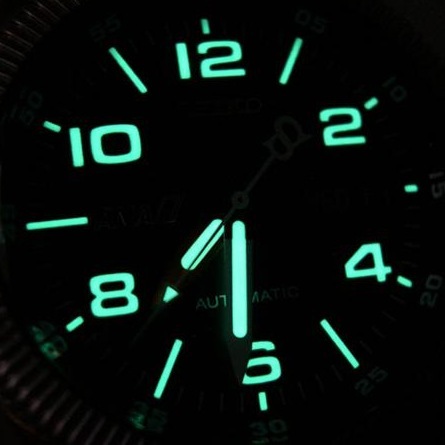 My watchmaker said he didn’t know, he had just taken delivery of a new batch of Seikos earlier that morning. I looked at the hang tag and it said SNKF11K. I’m usually blasé towards new releases from Seiko (they’re usually a rehash of old models with minor design tweaks) but this one was a totally fresh design. I thought it was one of the very few models that Seiko got it right from the start. He also brought out three other models - a white dialed SNKF09K with the same dial layout and two more variants, a dark blue SNKF05K and a black SNKF07K, both on stainless steel bracelet. These SNKF-series automatics had ultra-wide, 24mm lugs – something that I have not seen in a non-Tonneau cased Seiko before. Just in case you didn’t know, Tonneau watches are those rectangular or barrel/tank-shaped timepieces with bulging sides. They usually come with lug widths as wide as 24mm or more. While the SNKF11K isn’t exactly a new model, it was new to the Southeast Asian market in mid 2007. Some months earlier at least two SCWF members had been talking about a mysterious Seiko model that they had not seen before (it turned out to be the SNKF11K) and it turned out that it was debuted in the U.K and Europe. All four variations are equally attractive and each has its own unique selling point and merits. Since pictures speak thousands of words, let’s take a look at the “Fab Four". And I don’t mean The Beatles. I quite liked the fact that this was a large watch by normal Seiko standards (their dive watches don’t count). The jet black dial sported Arabic numerals which are fully lumed, had a regular styled lugs (which means aftermarket strap possibilities!) and a single protruding, nicely knurled crown. The SNKF09K is the white sibling of the SNKF11K and it’s the only model with black framed hands and white background date calendar for legibility. Both dials are surrounded by a chapter ring with numbered minute markers. 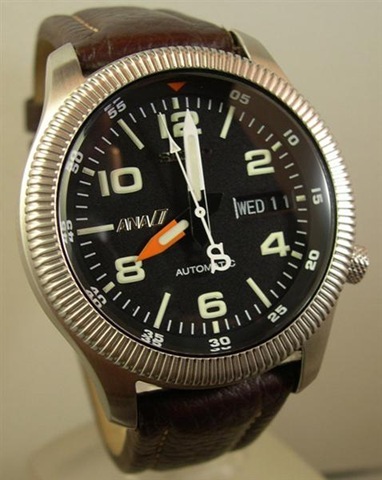 Some forum members opined that they liked the dial but the numbered chapter ring cluttered the dial’s look. Well I guess both the SNKF11K and 09K were the sportier versions of the four and I didn’t really mind those extra digits. 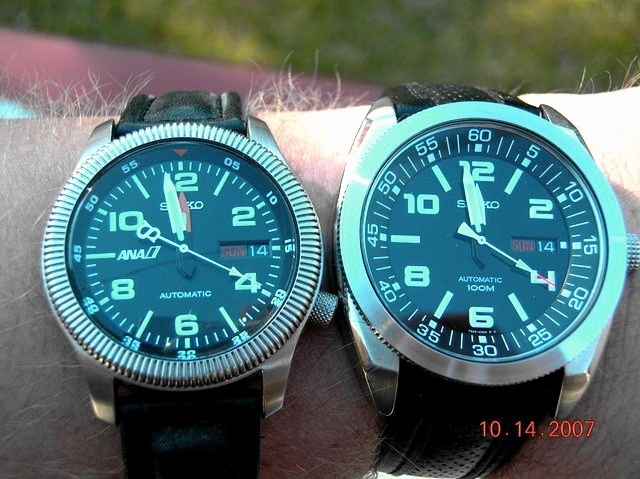 The bracelet-clad SNKF05K and 07K had a different dial layout, which had a much cleaner look. Both have extra-large split “12" and “6" hour markers and normal strips serving as markers for the other hours. Because of their mammoth dimensions, the SNKF-series were nicknamed the “BFS" or “Big Freakin’ Seiko" since it was tricky to remember the model numbers. Fortunately the alias caught on and whenever anyone mentions the “"BFS", forum members recognize that it refers to the SNKF-series automatics. The SNKF11K is instantly recognized by savvy Seiko enthusiasts as being a homage to the limited edition, Seiko ANA watch (7s26-0620) which was co-designed by Japan’s All-Nippon Airways pilots. The Seiko ANA is a rare bird and is normally sold in-flight on board ANA’s domestic flights. You can see some striking resemblances between the SNKF11K and the Seiko ANA. The SNKF11K is the bigger of the two and share the same shaped hour and minute hands from the Seiko ANA. Of course, the Seiko ANA has a ridged bezel, a finely knurled crown at the 3:45 position, a slightly different Arabic numeral font, an orange hour hand, a custom second hand with an “S" symbol on the opposite end and upgraded anti-magnetic resistance (16,000 A/M). Price-wise, you can bet that the Seiko ANA costs a lot more and harder to source than the SNKF11K. As you can see, the SNKF11K is larger than the Seiko ANA watch. 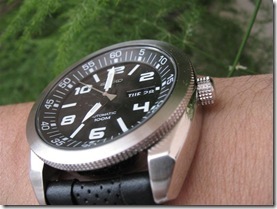 Photo courtesy of “Busdriver Mike"
The SNKF11K is quite comfortable on the wrist. It’s expansive caseback real estate means an even weight distribution. It might be a large timepiece but it doesn’t remind you that you’re wearing something huge. Despite its looks, the watch is not that tall and can fit under long sleeves easily. The calf leather band is perforated for that sporty appearance and comes with a signed buckle. Not bad, considering that this watch costs well under USD125. Top: The Seiko signed buckle and the polished case side. 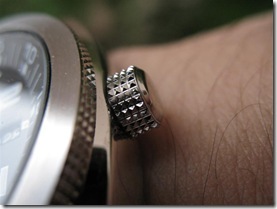 Note the knurled bezel edges. The case sides are highly polished to perfection (ok, maybe not up to Grand Seiko standards) and the surface of the lugs and bezel are matte finished. The bezel’s edges are knurled for aesthetic reasons and helps to break the monotony of an otherwise bland looking front. 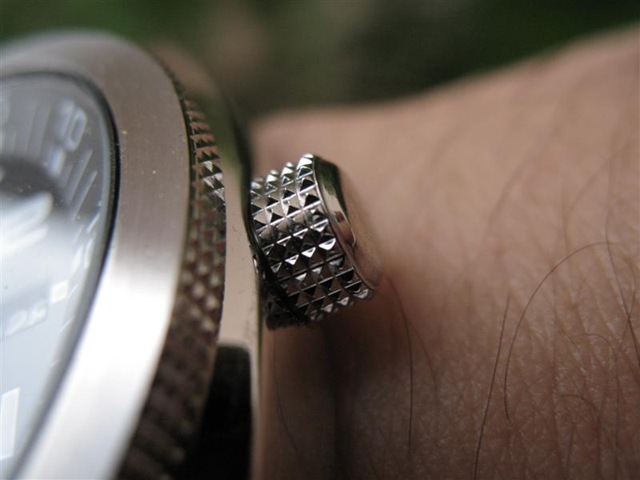 As expected, this watch has a non-locking crown but is adequately compensated by the elegant looking crown. Its short, rounded wedge-shaped lugs also mean that the SNKF11K is strap-friendly and doesn’t leave an unsightly gap between the watch casing and the strap ends. 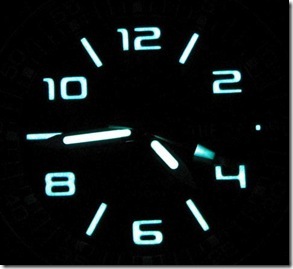 The SNKF11K’s lume is not too shabby but it’s no diver’s watch. I would say the brightness is on the slightly above average side. No problems telling the time in the dark once the dial lume is fully charged. I measured my SNKF11K’s dimensions with a set of analog calipers. Two more customary wrist shots on my 6.5" wrist. This is a sharp looking timepiece all right. I’m giving top marks for this watch as it’s not often that I see a Seiko model that gives so much bang for the buck. In fact, for the low asking price it’s hard to find faults with this one. Great review on the SNKF11K BFS. I actually bought this watch recently. Love the big 24 mm lug. It wears comfortably and has excellent readablility. Its really generous of you to have given it away to your good buddy. I decided to give the SNKF11K away because it was competing with the SNKF05K. Actually I gave my friend a choice to select either watch and he took an immediate liking to the SNKF11K. HI!We had the Seiko SNKF11 in one of the malls here in the Philippines last year but it was gone when I was about to buy it. And until now the model has not been available..
local dealers have not replenished it since then. Any chance,that this same model may re-appear here soon???? The SNKF11K first appeared sporadically for certain European markets before it was made available to Southeast Asian countries. 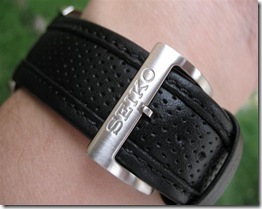 Seiko has its own distribution system which we consumers can only guess how it works. 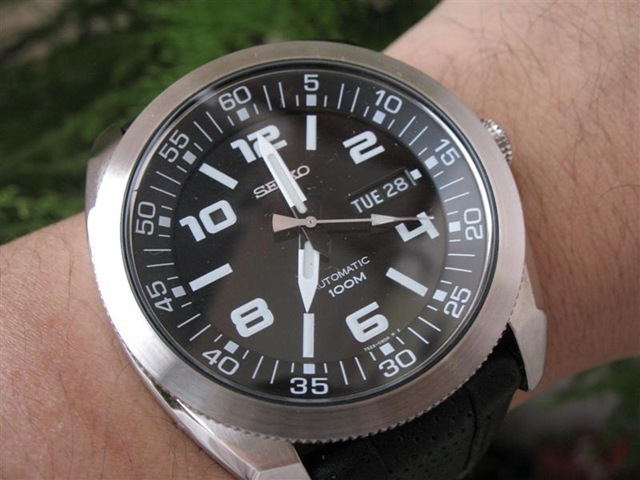 Generally, perpetually popular Seiko models can be found easily in most watch stores. 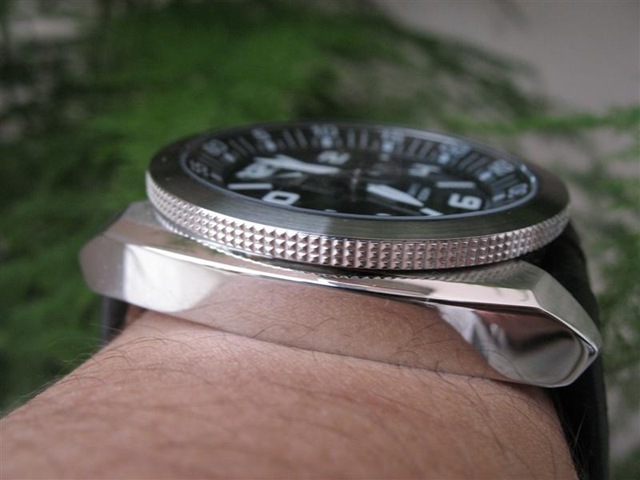 The SNKF11K, a handsome watch it may be, might have not been a commercial success. Seiko may allocate more SNKF11Ks in markets where it sells more easily. When sales of a certain model start to drop, the company will decide to end production of that model. There’s no sense in flooding the market with watches that will end up unsold. That said, the SNKF11K may have been discontinued recently. A few stores in Malaysia, Thailand and Singapore may still have stock of this model. In December I got hold of a Seiko BFS with white dial on black perforated strap, brand new. I sourced from a local “grey market” brick and mortar watch shop. Bought the watch for USD $125 and considered an excellent value. It is a nice piece as your review describes. However, for some reason, never wore it and sold it intact in its box and still with the bracelet tag attached to it to a local WIS friend for what I paid for it. Don’t know what happened, but once I got the watch, did not felt compelled to wear it (and I like big watches). I felt in love with the SRP017 and SRP013 (4R16A movement) that I bought fron the same shop days later. Weird, eh? On the BFS, I haven’t seen fresh stocks at local ADs. 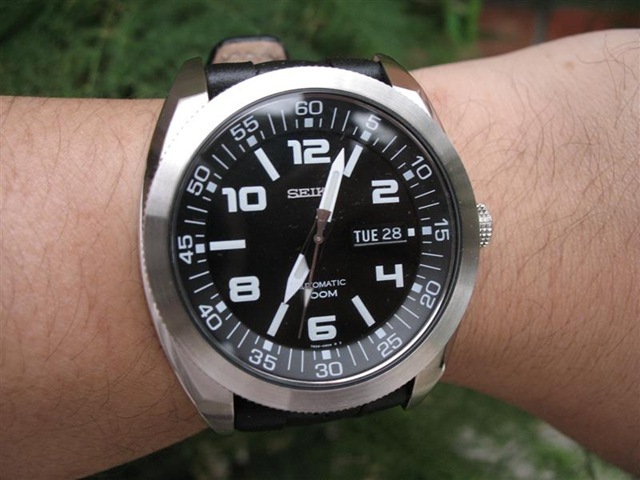 It could be that Seiko was testing the market with oversized automatics that don’t belong to the Seiko 5 family (e.g. 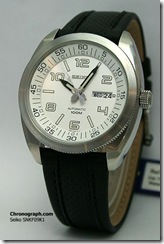 the SNM001/003K, Seiko’s first non-Seiko 5 dress automatic based on the 7s35). Both models lived a short life on the market. Great review. Do you have any ideas where can get this timepiece around Klang Valley? This is my birthday gift this year, hopefully. Thanks for the comments. I’m sorry but I don’t have a clue which stores have the SNKF11K. Not all Seiko watch dealers carry the SNKF11K and you’ll have to do some watch hunting, which was a pastime I used to indulge in. Try visiting the major shopping malls in Kuala Lumpur at hop from one store to another. 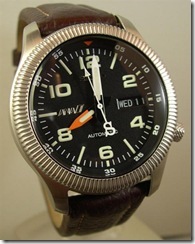 I have not seen this watch for sale locally for some years although you can buy it from Internet sellers and on eBay. If you have a cellphone, PDA or iPad it’s a good idea to have images of this watch and show to the dealer or sales assistants in case they remember seeing this model in the past and can order one for you, if possible. Reply already sent to your email as you asked the same question via the contact form. I’m not sure if the SNKF11K has been officially discontinued because Seiko does not inform the public of discontinuation of their products. If Seiko finds a particular model not selling well (no matter how handsome it looks) it will not hesitate to cease production of the model. 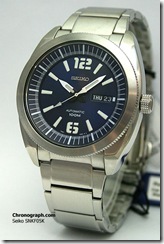 Seiko is a profit oriented watch company and selling watches is at the top of their priorities. Which explains why the evergreen SKX007K diver, which first hit the market way back in 1996 is still in production today. I started reading your review on SNKF11K but I happen to like “Ana” model much more. I wish I could grab one on a day  It is always a great charm to surf through your blog. Special thanks for your efforts of enlightening us on these special Japanese beauties. Thank you for the nice words. 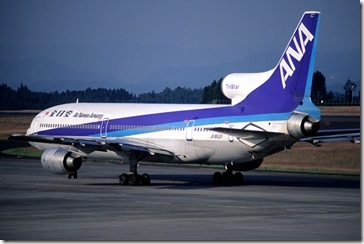 The Seiko ANA was an in-flight purchase if one flies an All-Nippon Airways domestic flight. I don’t think Japan Air Lines sold the Seiko ANA on board its flights, domestic or otherwise. 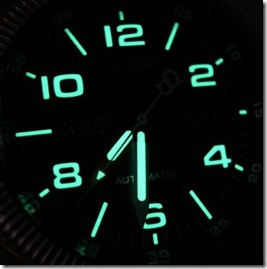 Have you heard of a SEIKO SNKF44J? I have seen this listed on ebay and but cannot find it listed anywhere else. Yes, there is such thing as the SNKF44J. It’s a gold plated Seiko 5 automatic and judging from the reference code it appears to be a recently introduced model. Just Google for “SNKF44J” and you’ll see several sites selling the watch (not just eBay). Thank you for the excellent review of the BFS. I recently purchased my first Seiko automatics and have developed an appreciation for these type of watches. 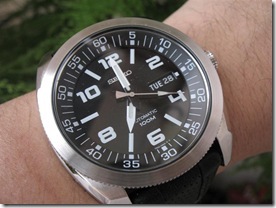 I have read a few online watch forums and articles regarding the Seiko SNKF05 and SNKF11. 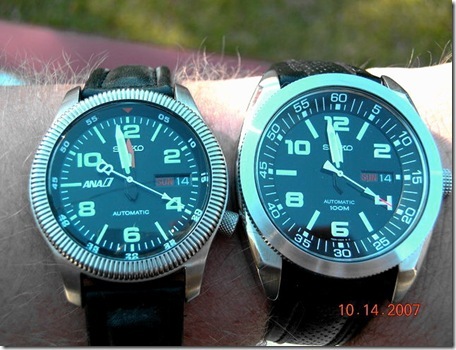 I was wondering if one could still obtain either (or both) models and how much is a fair price for these watches. Congratulations on joining the Seiko club! 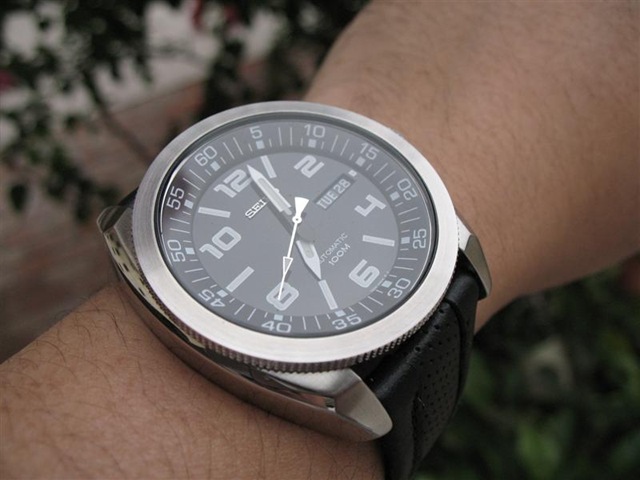  I have no idea if Seiko still makes either the SNKF05K or the SNKF11K today as it has been a good four years since its introduction. I’m not surprised if the entire BFS series has been discontinued. 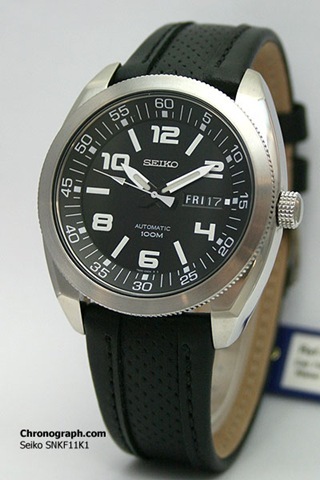 Seiko considers these models as one of their countless, mainstream low cost automatics. 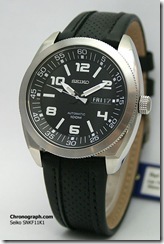 Due to this fact, you won’t find the BFS range listed on any official Seiko website. Roachman.com used to sell the SNKF11K for USD169 in the old days. Try contacting them if they’re still able to source one. Thank you for the warm welcome, your reply and directing me to Roachman.com. I will contact them and continue the hunt should they be unable to assist me. 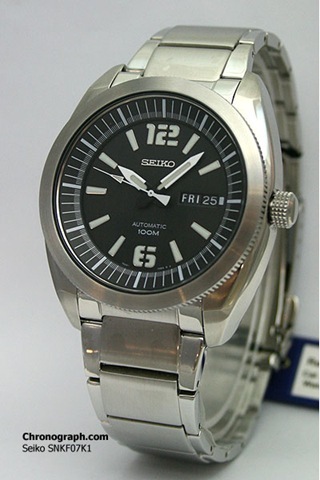 Just in case anyone would be interested, I am selling my Seiko SNKF11, brand new with box, manual and warranty card. Nice watch indeed but I already owned a couple BFSes. This was an extra purchase when I chanced upon a store. Was planning to store it for years to come but when an urge for another Seiko diver watch struck me, I decided to offer this up for sale. How are you? I just read your offer and was wondering if it is still available. How much are you asking for it? Please e-mail me (mataal@hotmail.com) with details if so. How are you? I just read your offer and was wondering if the watch is still available. How much are you asking for it? How are you? For some reason it seems that my replies to your post fall under the pingback by New shoes for the BFS. If I am doing something wrong, my apologies. I haven’t seen the SNKF11K or its sibling models at local retailers for quite sometime. It may have been discontinued; perhaps these models were not selling that well. I’m sure there are old stocks available but the problem is trying to locate a store that still has them. You might want to search eBay for this model as sometimes SNKF11K watches for sale will not show up on Google searches. Hope you get yours too guys. BFS is fantastic. Still my favorite among my watches. Thanks for all the work you do. Through reading your stuff I have become a “semi-WIS”. All this through buying myself a Citizen ATO 787-55 for Christmas. I have recently replaced a 20 yo Seiko automatic (repair estimate $250) with a rather nice “cheapie”, a Seiko SNKE53K1. I notice there is no serial number at the back, only the 7S26-02W0. Is this Seiko’s standard now? I see these are quite common watches with the online merchants so maybe serial numbers are a thing of the past with the cheaper lines. I also note in your article on the BFS you say the accuracy is less than 40 sec/day, plus or minus. Is that what I should expect from the SNKE? All Seiko watches, with the sole exception of certain special, one-off production models (like limited edition ones) have serial numbers unique to the watch. I noted that you’ve managed to locate the 6-digit serial number of your SNKE53K. 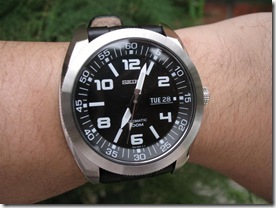 Before the late 2000s, Seiko 5s have their serial numbers printed on the glass display. 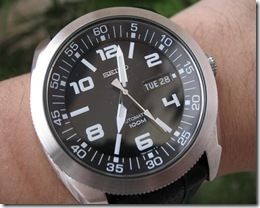 I suspect Seiko’s switch to engraving the serial numbers to the rim of the caseback is for aesthetic purposes. It was probably a decision made by their marketing department. This is not an entirely new practice for Seiko as they had been printing the serial numbers on the rim for their upscale models (not the Seiko 5 family though). As for the factory specifications relating to the BFS’s accuracy, it was the official accuracy specs for the 7s26 caliber regardless of the model that the movement is fitted to. 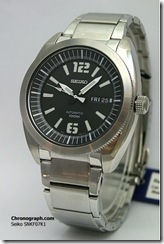 The actual Seiko published accuracy for the 7s family is within -15 sec to +40 sec/day. If your watch is running slower or faster than this figure, it’s out Seiko’s acceptable manufacturing tolerances and you’ll need to have your watch regulated. P.S. I’m sorry I haven’t found the time to sit down and reply to your well written email yet.